This activity is connected to the CCGPS ELACCKL2a. Capitalize the first word in a sentence and the pronoun I. This packet contains 16 pages. Each page has a simple story on it including five sentences. 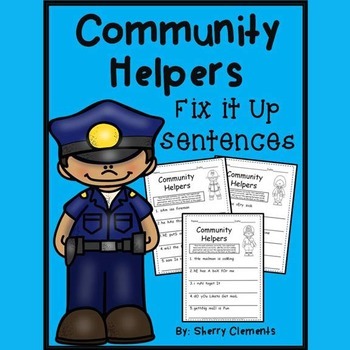 The sixteen stories are about a doctor, fireman, policeman, crossing guard, detective, mechanic, mailman, teacher, chef, nurse, trash collector, vet, farmer, fisherman, lifeguard, and waiter. The sentences are not written correctly. The first letter in each sentence has not been capitalized, capital letters that need to be lowercase have been added to the middle of words/sentences, ending punctuation is missing, and some words need spacing between them. Have your students rewrite each sentence correctly. Begin each sentence with a capital letter, make other letters in the sentence lowercase, add the correct ending punctuation, and make sure there is correct spacing between all words. 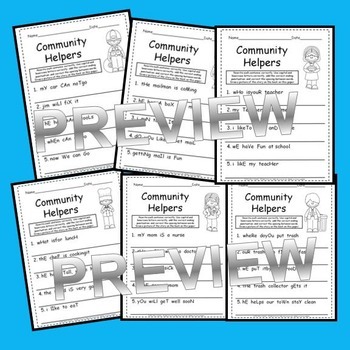 The sentences used contain frequently used sight words, decodable words that students should be able to read, and a few other common nouns that students see often. These activities are great for morning work, literacy centers, homework or for a quick mini lesson on including capital letters, ending punctuation, and spacing in sentences. Students can read the story to a partner or to the teacher after correcting the sentences. Students could also add other details to the story using the back of their paper. 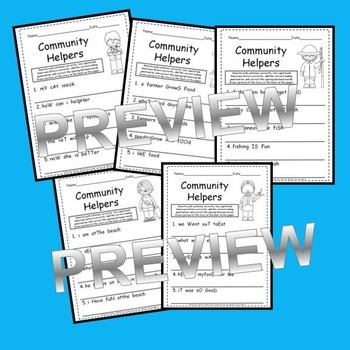 Take a look at the PREVIEW to see all pages included. 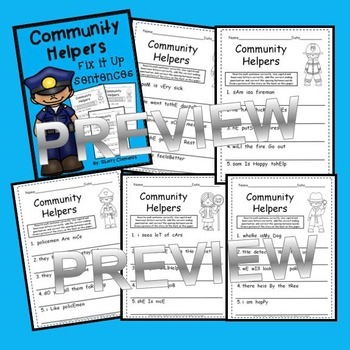 This pack is now available in a Community Helpers Bundle saving you 26%!